In June, 2008 I was traveling virtually in New York City through a new technology offered by Google called Street View. Google Street View lets the user walk the streets of areas that have been filmed with their camera vehicles, looking around with a 360 degree view. As I was looking around NYC I saw a Chinese restaurant that I thought would make a good painting. So I took a screenshot, opened it in Photoshop and used it as a reference for the painting. After this initial virtual painting trip I started looking around other areas in which Street View was offered, hoping to find more inspiration. Not long after, I came up with a plan to paint one view from each of the 50 states. At this point I contacted Google and began discussing the use of Street View for artists. Google representatives then gave me permission to use Street View images as references for artwork with certain conditions. These works could then be sold without fear of copyright infringement. Since this time in 2008, I have completed a few different series using Street View along with many individual paintings. With many more series in the planning stages. 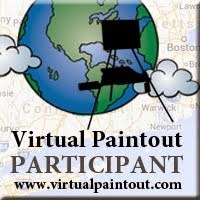 The first Virtual Paintout was started in February 2009, in Baltimore, with a total of 6 participants including myself. Since the first VPO the project has grown in the number of participants and available locations. The largest number of participants for one month was 143 for the Canary Islands. The project has been averaging around 100 participants at the beginning of 2013. The goal of the project has always been the same; to give artists an opportunity to gather together virtually, and paint or draw in the same area. I have felt that one of the most interesting aspects of the project is to see the variety of subjects chosen by the participating artists. I try to choose an area with a diversity of subjects; i.e. landscapes, seascapes, urban scenes, farm scenes, etc. The idea has now garnered worldwide attention in the media, with TV and Radio interviews, and many written articles, both in print and online. You can go to the following link on my website to see a clickable list of the press regarding the use of Google Street View and art. One of the main thoughts I've had through the past four years of the project is that the disabled artist community could be using this technology for their benefit. I thrive for painting outdoors, en plein air, but know that there are many, many artists that do not have the ability to do that. With the advent of this technology, not only do these mobility-challenged individuals have an opportunity to travel the world virtually, but to also connect with other like-minded artists. I am available to conduct workshops combining my techniques with this technology. In the workshop, I can take your group through each step of the process, from their first glance at Street View, through to the completion of their work of art.